Featuring Pippa Greenwood, Eric Robson, Roy Lancaster and organic gardener Bob Flowerdew in the National Botanic Garden of Wales. The original painting was commissioned by the BBC's Heritage Department to commemorate BBC Radio 4's "Gardeners' Question Time" passing 50 years of broadcasting and now resides in Broadcasting House in London. The scene shows a recording taking place in the beautiful flora and architecture of the National Botanic Garden of Wales. The panel on the right includes Pippa Greenwood, Eric Robson, Roy Lancaster and organic gardener Bob Flowerdew fielding questions from the audience by Assistant Producer Jo King. All the members of the Gardeners' Question Time team have expressed their praise for the painting and they all own a print. This Gardeners' Question Time limited edition print would make a wonderful gardening gift. 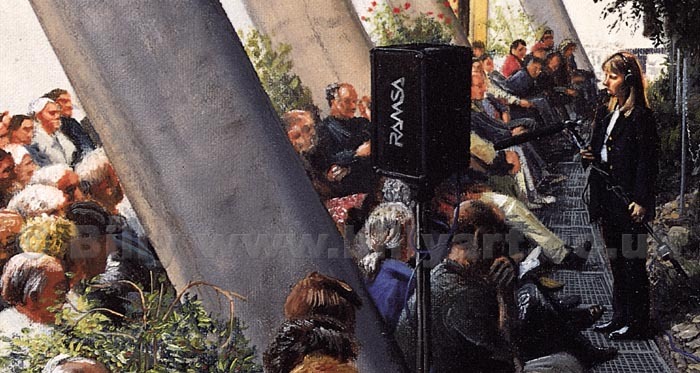 Scroll down to view close up details of the Gardeners' Question Time celebratory painting. Detail showing production equipment scene used to record the BBC Radio 4 Gardeners' Question Time radio programme within the flora of the National Botanic Garden of Wales. In the Gardeners' Question Time panel are left to right presenters Pippa Greenwood, Roy Lancaster, Eric Robson and Organic gardener Bob Flowerdew. 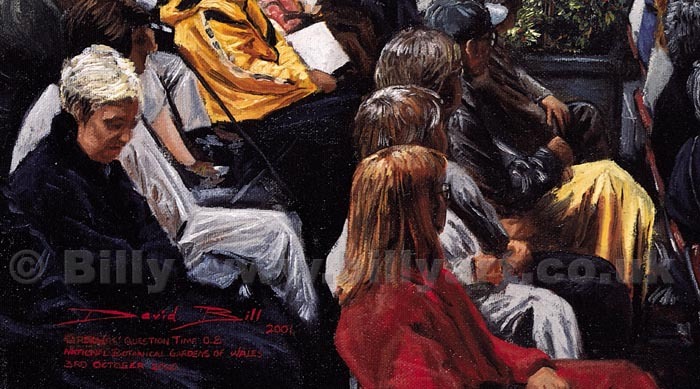 Close up detail of David Bill's painting of the Gardeners' Question Time panel recording in the Botanic Garden of Wales. Left to right are the presenters Pippa Greenwood, Roy Lancaster, Eric Robson and Organic gardener Bob Flowerdew. Gardeners' Question Time production assistant Jo King with the 'roaming question mike' among the Gardener's Question Time audience amid the wonderful architecture of the Botanic Garden of Wales. The audience for this recording of Gardeners' Question Time for BBC Radio 4 was made up of members and friends of the National Botanic Garden of Wales. 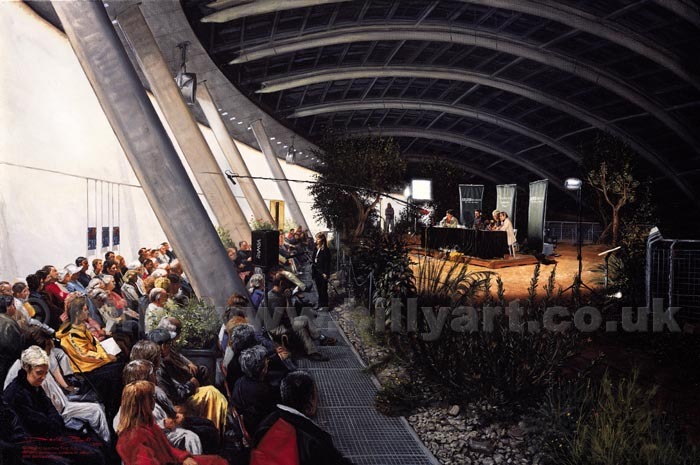 Gardeners' Question Time Audience detail of the friends of the Botanic Garden of Wales with artist David Bill's signature from the bottom left hand corner of David's painting for the Heritage department of the BBC. 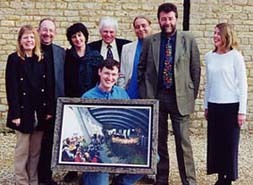 The original is part of the BBC's collection in Broadcasting House and was commissioned by Justin Phillips, Head of BBC Heritage at the time of the Gardeners' Question Time painting commission, to commemorate the 50th year of bradcasting on the BBC of Gardeners' Question Time and would make a great gardeners' gift. 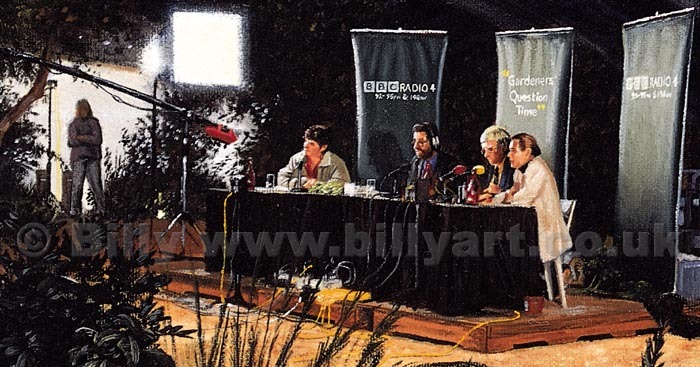 Unfortunately Justin Phillips, Head of BBC Heritage, died that year of an Asthma attack and never saw the completed Gardeners' Question Time painting by David Bill. Justin left a wife and four daughters. Justin Phillips had also just completed a book on C S Lewis' recordings for the BBC for Harper Collins Publishers. Purchase C S Lewis at the BBC by Justin Phillips here. Justin Phillips had also written another book for Harper Collins publishers titled 'Confidence' which was about his work life as a Christian particularly in the BBC. Confidence by Justin Phillips is an out of print book but second hand copies are available and is a worthwhile read.